The Garden of Eden in Lucas, Kansas is one of those very special Folk Art sites that are bound to impress the visitor. S. P. Dinsmoor (1843-1932) began construction of the 11 room Log Cabin Home made of native Kansas “post rock” limestone in 1907 at age 64. Dinsmoor, who was a Civil War veteran, insurance salesman, farmer, teacher, Freemason and an outspoken Populist Party member was quite adept at debating politics. 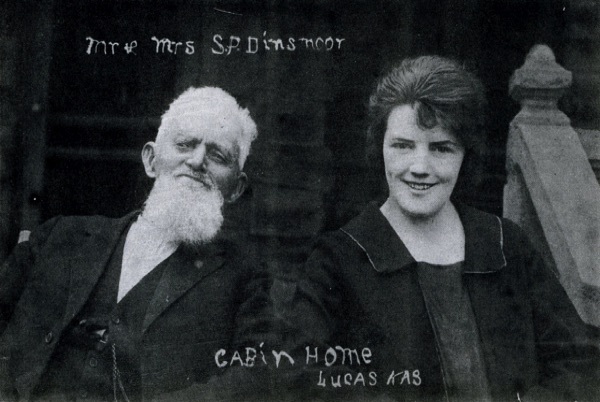 He arrived in Lucas in 1888 with his wife Frances and their five children to start a new life. After their arrival he soon founded the United Order of Anti-Monopolies a populist inspired organization. Eventually he would include many of its ideas into his Garden of Eden sculptures along with Masonic symbols. The Garden began in 1906 when he first constructed a cement fence around his property soon followed by the creation of his Log Cabin Home made of Kansas Limestone, an abundant local material that he procured for its construction. By 1909 with the cabin completed, the now retired Dinsmoor tried to sell the home and when he couldn't find any buyers, began to create a cement grape arbor in the backyard. The new arbor also included a cement sculpture of Adam and Eve at its entryway. He next constructed some cement trees to go with the arbor and soon the Garden of Eden began to evolve expressing his Biblical and political ideals along with comments on current events. By 1915 the Garden had become a tourist attraction drawing people from all over to the small town. After his first wife, Frances died in 1917, he soon hired seventeen-year-old Czech immigrant Emilie Brozek as a housekeeper. He married her in 1924 when she was twenty and he was eighty-one. Five months later she gave birth to their fist child, Emily. A second son, John was born in 1928. Dinsmoor died in 1932 and was buried as he wished in the limestone pyramid shaped mausoleum behind a sheet of glass where he can be seen today. Emilie later remarried and lived on the property for several years before moving. She in turn sold the garden to Dinsmoor's daughter from his first marriage. The property served as a rooming house for several decades and was eventually restored as a tourist site in 1969. Main entrance to Log Cabin Home. Side view of the Log Cabin Home. Detail of the notched limestone logs. Cast cement name detail on the building. Entrance to The Garden of Eden. Goddess of Liberty being cut down. Cain, his wife and Dinsmoor's cement American flag. Modern civilization with a soldier. Mausoleum as seen form the porch. Limestone mausoleum and one of only two iron doors in Lucas at the time.The other was at the local bank. Dinsmoor's cement flag invention and his call for the American turkey to be the nations symbol instead of the bald eagle. 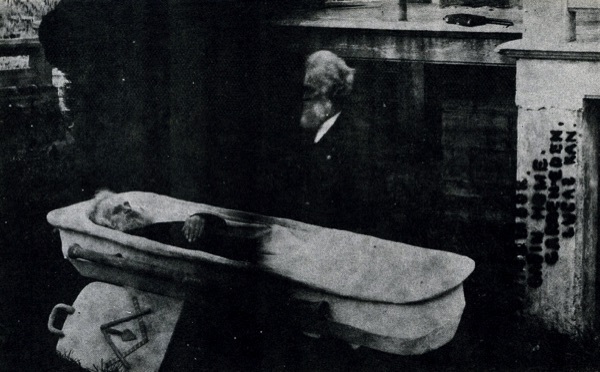 Dinsmoor in a manipulated photograph showing himself viewing himeslf in his casket. 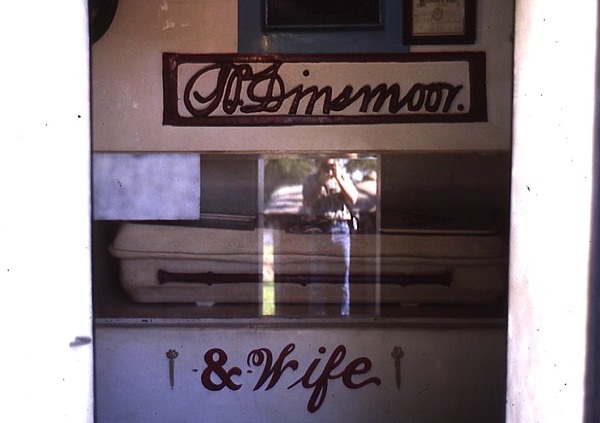 The cement sign, Dinsmoor and Wife sign above the entry to the mausoleum. Dinsmoor in his casket on display behind a sheet of glass in the mausoleum. The wagon Dinsmoor used to transport the limestone for his Cabin Home.